There are many reasons why employers may not hire you even when you’re a model interviewee. You’ve crafted a dynamite resume, practiced answering the toughest questions, and even wrote your thank you letter in advance to avoid procrastination. So despite your high level of preparation, why hasn’t the employer called you to offer a job? Men and women need to feel a spark of mutual attraction to have the dreaded first date. In the same way, the employer offered you an interview because something about you, most likely your resume, appealed to them. Out of the hundreds of applications and resumes they sorted through, yours stood out. Knowing you made the cut should put you at ease, but remember that men take only 15 seconds to decide whether or not they want a second date, and women take nearly an hour. You need to make a memorable first impression. Showing up neat, clean, and dressed conservatively will go a long way in getting that second interview or the job. There’s nothing worse than being late for your first date. If your date says they’ll pick you up at six and arrive at seven, you’re likely to feel annoyed. Of course, the annoyance factor quadruples if you’re meeting each other at a restaurant and you leave your date sitting alone for an hour. The same goes for interviews. Make sure you are ten to fifteen minutes early, just in case you get stuck in traffic or can’t easily find the office. Being late tells the interviewer that you don’t really care about the job and makes them wonder whether or not your responsible enough to work for them. Just as a man or woman feels uncertain about meeting new people on a first date, the interviewer feels that way about you. 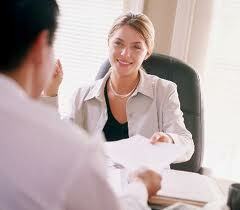 You can reduce uncertainty about who you are by being open and honest with your interviewer. Be prepared to talk about yourself, your experiences, your skills, and your abilities without sounding conceited. If the interviewer gets the impression that you’re all talk and no action, he or she may not call you back. Discussions can be awkward on a first date, especially if they’re forced. The same goes for job interviews. Try be relaxed and easygoing in your conversation. Don’t discuss unpleasant or inappropriate matters and don’t try to sound like money is your highest priority. In the same way that you don’t want your date to bring up old boyfriends or girlfriends, don’t speak negatively about your former employers. You can usually tell if you have a chance at getting a second date when conversation reveals that you have a lot in common; in a job interview, you should look for opportunities to talk about shared interests that you and the interview have. Pay attention to the interviewer and your surroundings to see if there are any clues about his or her interests, and if you find something, try to work it into the interview conversation in a natural way. When your date doesn’t pay attention to you, you’re less likely to go out with him or her a second time. Being aloof, talking or texting on your cell phone, or holding side conversations with others is a big turn off for your date. Avoid such behaviors during a job interview. Giving the interviewer your complete attention by maintaining eye contact, sitting up straight, facing forward, and keeping an open posture will show him or her that you value his or her time. Opinions about good night kisses vary from person to person. Obviously, you aren’t going to kiss your interviewer, but you should give him or her a firm but gentle handshake before and after the interview. For some people, the kiss is a deal maker or breaker when it comes to scheduling a second date. An interviewer may not call you back if you have sweaty hands or an awkward or limp grip. Practice shaking hands with a friend if you’re not accustomed to doing it; it shows you’re friendly and relaxed. By treating your interview like a first date, you’re getting yourself into the mental frame of mind that can make a great first impression. It doesn’t matter what kind of job you’re interviewing for, the relationship between you and your prospective employer depends on how well you get along with each other. Interviewers size you up to see if you’re likable to them; if you are, they’re more likely to consider you for the job. Please contact us for more tips about finding and obtaining employment.